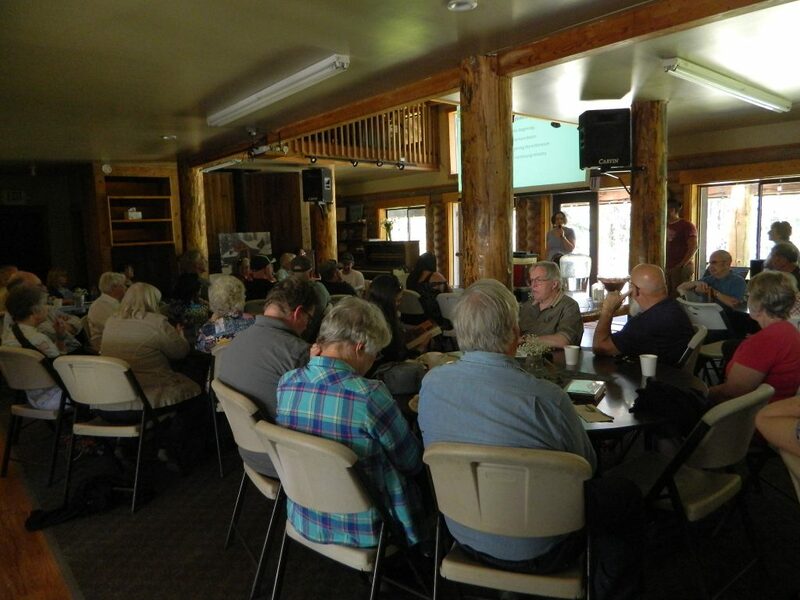 Camas Meadows Bible Camp has been around for 45 years and our founder Del Griffith for even longer! He just celebrated his 100th birthday on April 22nd. Such illustrious milestones demanded a bit of a party and so that was what we were up to last weekend. So we gathered at the camp on May 12th. 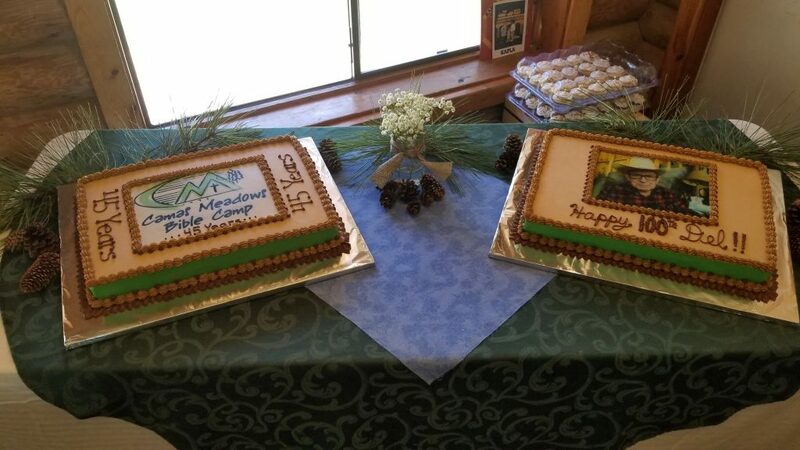 Campers, board members, counselors, cooks, nurses, speakers … those who love Camas Meadows and wished to celebrate with Del traveled up that twisting mountain road for a bite of cake and a time of reminiscing. It was a gorgeous spring day with scattered wildflowers blooming and the scent of new forest growth on the wind. Camp people young and old packed the lodge to hear stories about the camp’s beginning years as well as a few of Del’s own tales. It was a time to visit with good friends from the past and discover new folks with a connection to the camp or to Del. Looking out across the room was such a reminder of all the people Del and Autumn have blessed through the years. 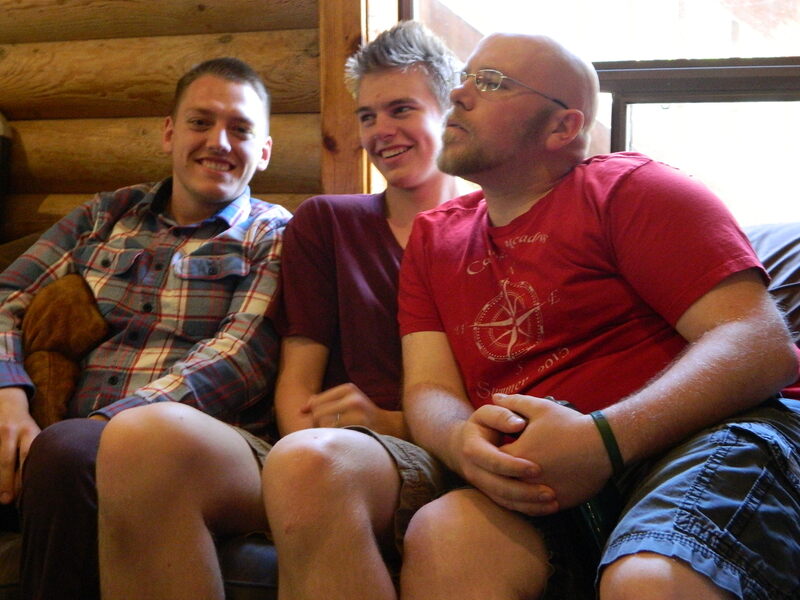 A camp intern, counselor, and speaker sat on the couch … it sounds like the start of a joke, but they actually behaved pretty well. Yes, I’m talking about you Warhammer! Once the beautiful cake was eaten and the many tales of camp adventures come and gone had run their course, everyone said goodbye and walked beneath the new sign placed at the entryway in Del and Autumn’s honor. 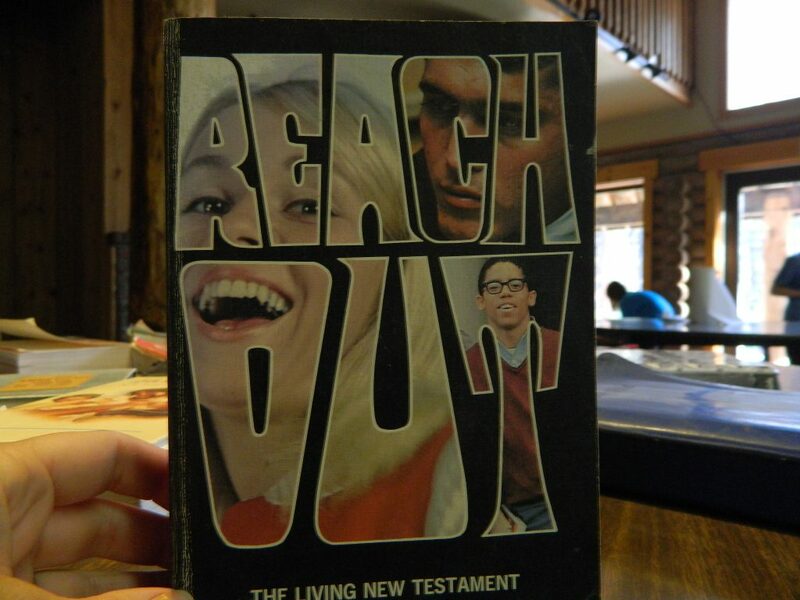 In 1973, Del and Autumn stepped out in faith and turned a crazy dream into reality. Forty-five years later, God’s work is still going on in this quiet mountain meadow tucked back into the forest. It was a delight to have the chance to thank Del for his lifetime of service and celebrate a monumental birthday together. May what they started continue for many years to come. 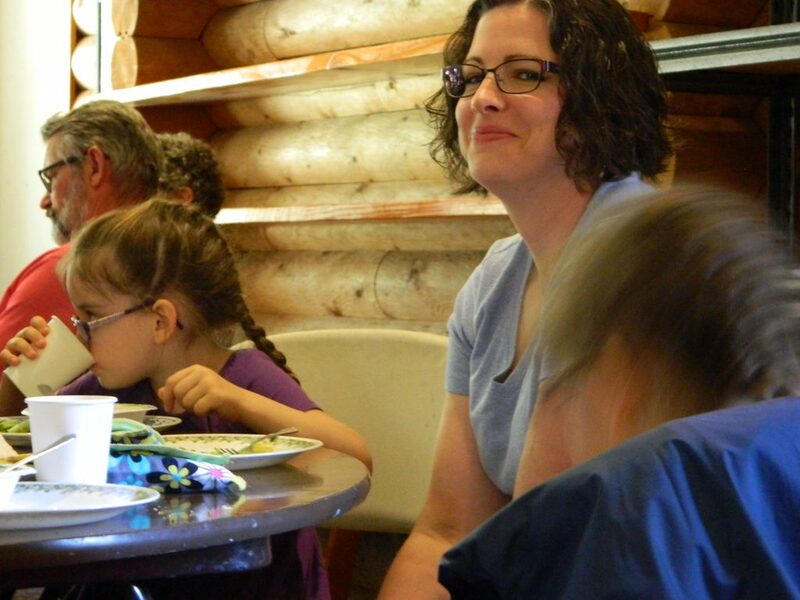 We had to say goodbye to our camp matriarch, Autumn Griffith, this week. On the morning of March 1, she left us to greet her Lord during the quiet of a spring snowstorm. As Del says, the camp would have never happened without Autumn. The daughter of a southern belle and a fast-shooting Jack-of-all-trades who was deputized to bring in criminals who fled into what was then Oklahoma territory, Autumn started keeping house at the age of ten when her young mother passed away. 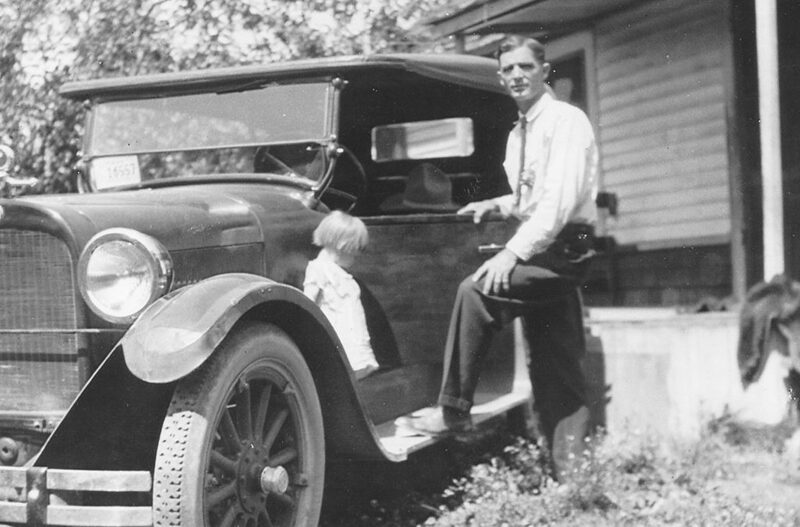 She is pictured here as a toddler with her father, Ben. I have never seen the gift of hospitality shine with a warmer light than it did in the talented and gracious hands of my grandmother, Autumn. 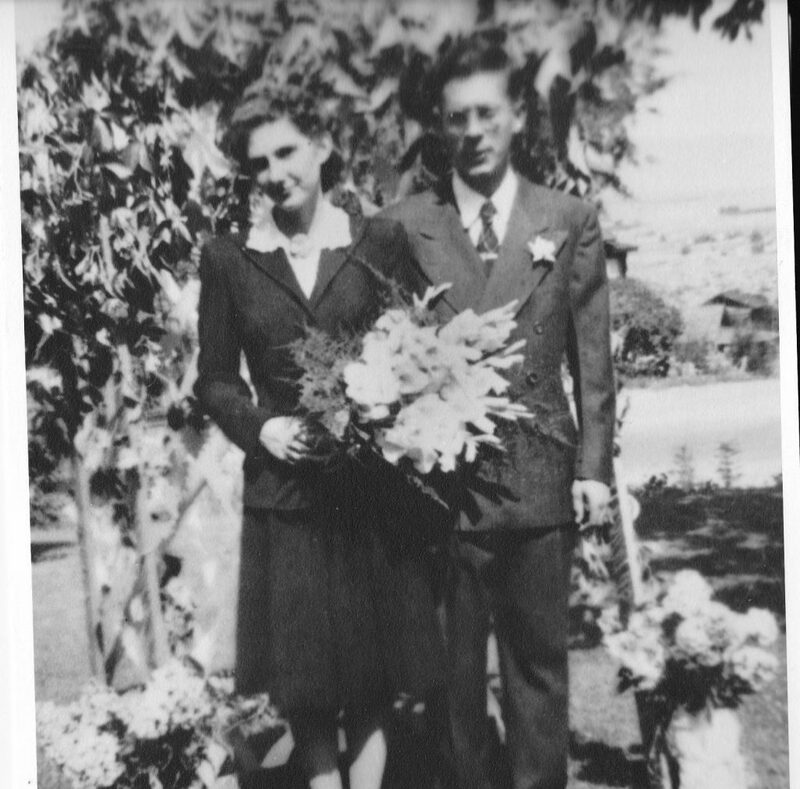 Autumn married Delbert Griffith on July 25, 1942 at the home of Clarence and Lily Snode in Wenatchee, WA. 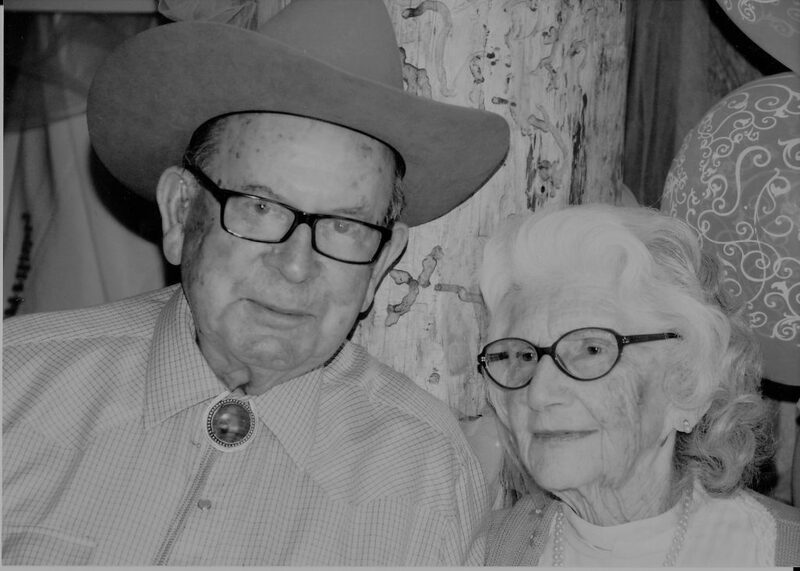 She loved horses and wildflowers, hunting and long walks in the forest, caring for her friends and family, and feeding anyone and everyone who walked through her door. Our camp founders settled down in Chelan where Del was a milkman and Autumn poured her heart into raising their four children, Terry, Sharon, Clint, and Greg. 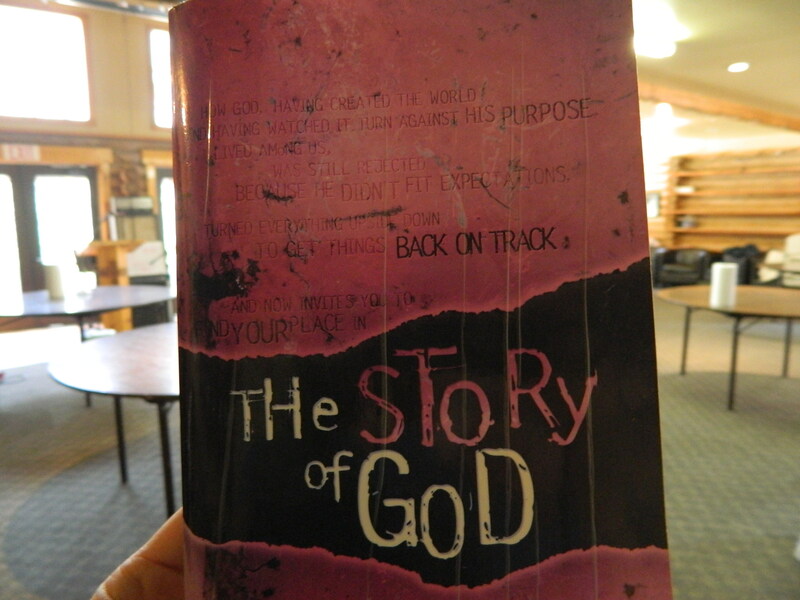 There was no electricity, indoor plumbing, or running water when the camp first began to minister to kids in 1973 but they managed all the same. Del worked the grill while Autumn did the baking and washed dishes with her sister Lily. I still remember the taste of the no-bake cherry cheesecakes she would make for the campers when I was a girl. Delicious! 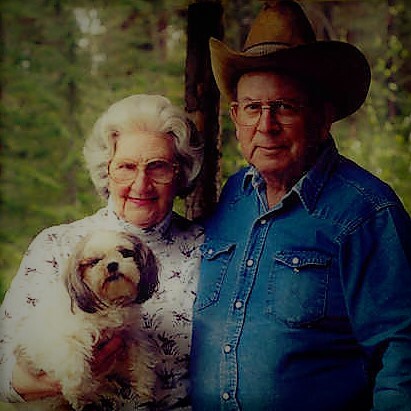 The picture above shows Del and Autumn celebrating their 70th wedding anniversary in the camp lodge. I have about ten different pictures of us trying to pose for the camp Christmas card here, but in this one, Autumn is laughing as Scruffy and I attempt to wrangle our rowdy boys. 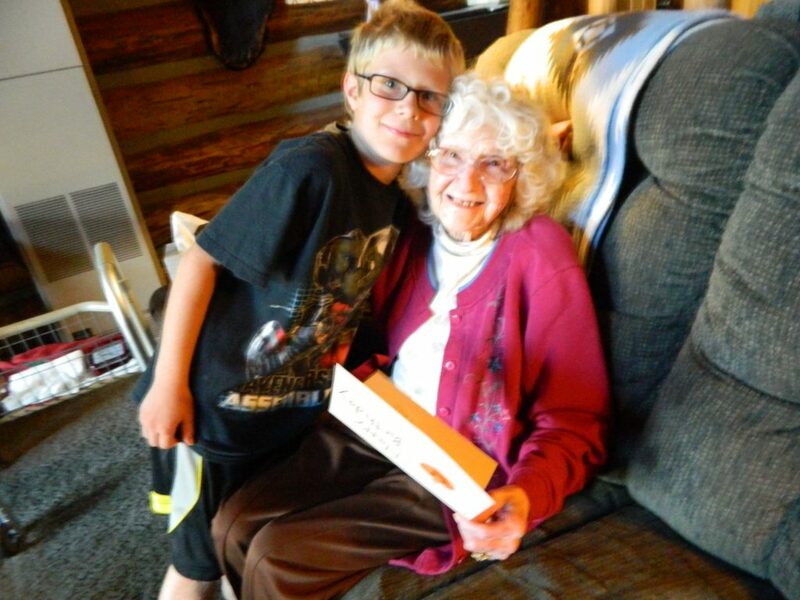 So many children called her “Grandma.” Her own eleven grandchildren, twenty great grandchildren, and three great great grandchildren as well as the innumerable young people who felt the warmth of her love and care when they met her at camp or were invited into her home. Autumn was known for serving amazing, home-cooked meals on blue willow china and urging passing children to take a candy from their special cut-glass dish, whether their mothers thought they needed a candy or not! 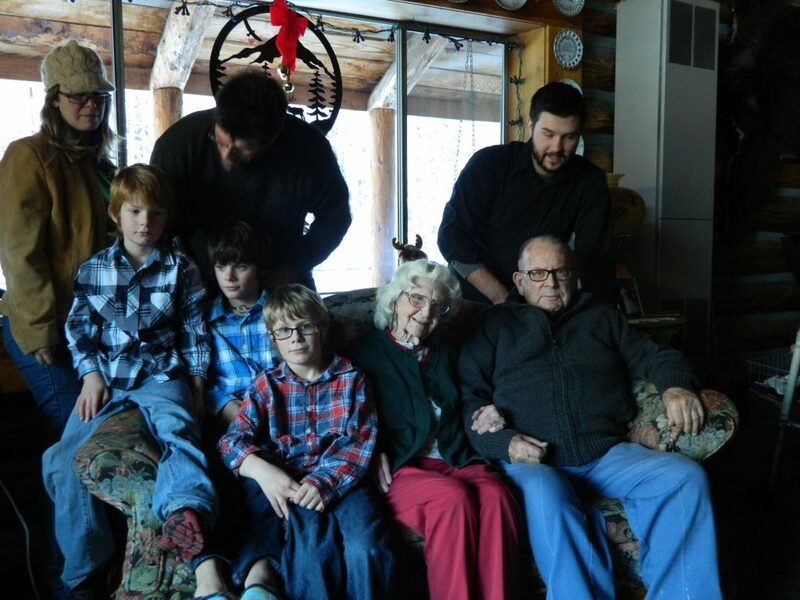 Here she is on her 90th birthday, celebrating with family in their log home near the camp. 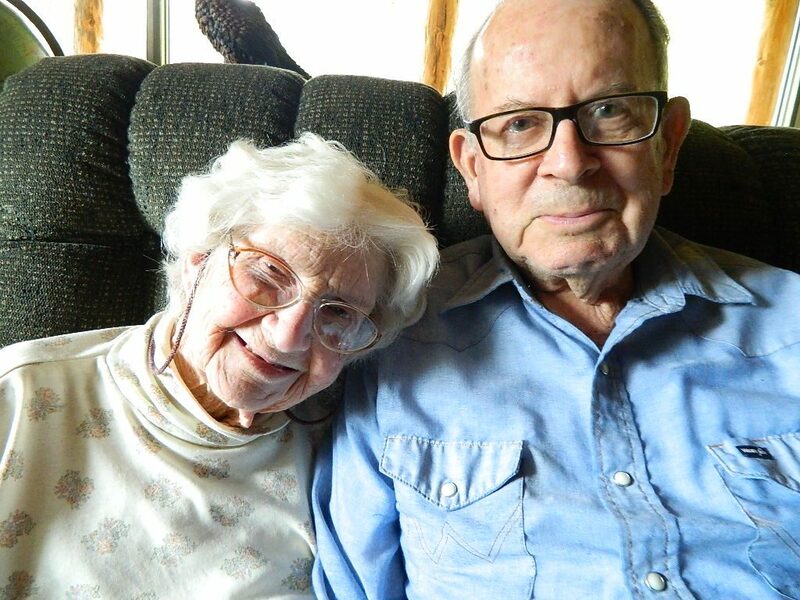 Autumn and Del celebrated 75 amazing years together in July. This photo was taken just a few days before the big day. 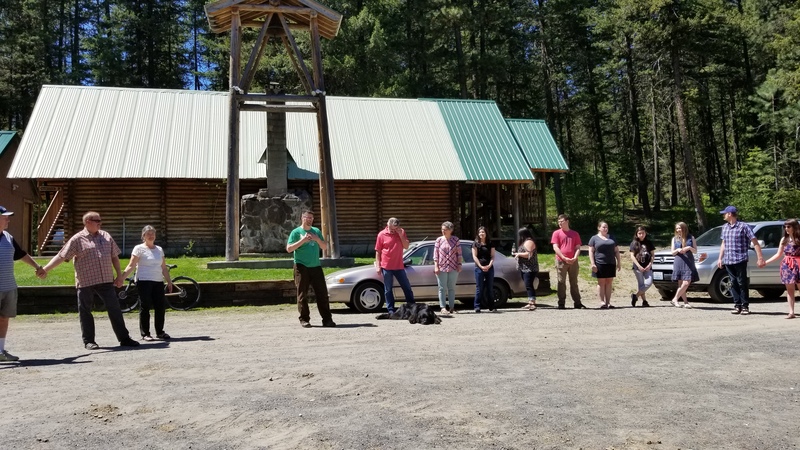 An amazing group of friends and family made it possible for Autumn to stay in their beautiful log home until her very last day. It is fitting that she would depart to meet her Lord from the place where she spread His love for so many years. Whether it was a cup of tea and a story, homemade cinnamon toast baked in the oven for a cold child rushing in from outdoor play, or simply a smile and pat on the hand, Autumn brought the brightness of Heaven into whatever she set her hand to do. She is surely rejoicing with Jesus today and all of us who knew her, loved her dearly, and wish her well as she embarks on new adventures with her Lord. A funeral service will be held at Telfords Chapel of the Valley 302 9th St. Wenatchee, WA at 2:00 pm Thursday March 8th. The family will be greeting friends and relatives at Camas Meadows Bible Camp at 5:00 pm that evening for a potluck get-together. Burial will follow the funeral at Evergreen Cemetery in East Wenachee. If attending the potluck, those whose last names begin with A–L please bring a main dish, M–S please bring a salad, and T–Z please bring a dessert. Thank you so much! 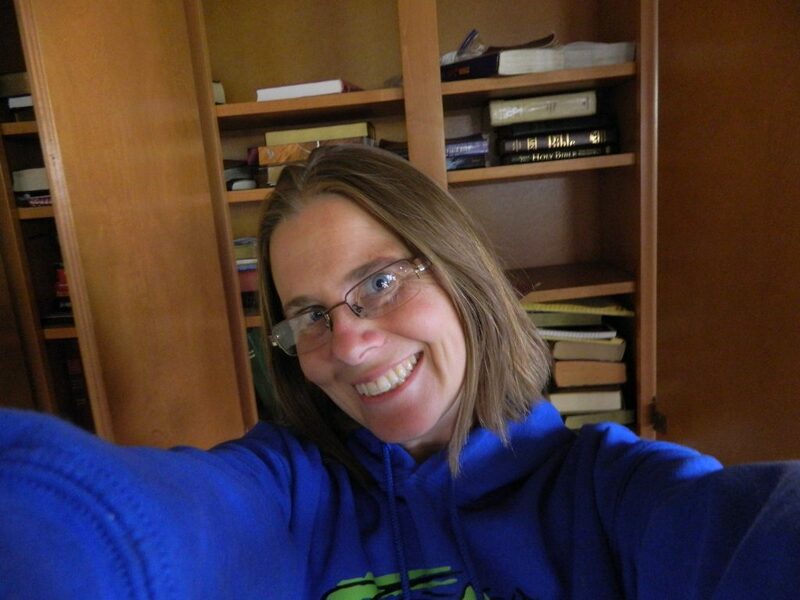 In lieu of flowers the family requests memorial donations be made to Camas Meadows Bible Camp, P.O. Box 304 Cashmere, WA 98815. 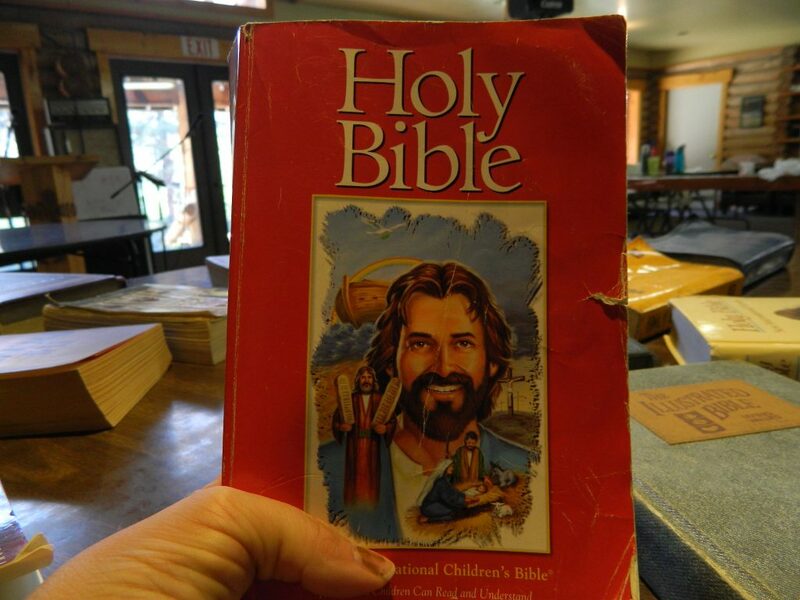 At our Labor Day work retreat I strove to organize the Bible Cupboard and realized that the Bibles contained therein tell the story of the many years that the camp has been a place to rest, be inspired, and learn about the mighty power and inexplicable love of God. 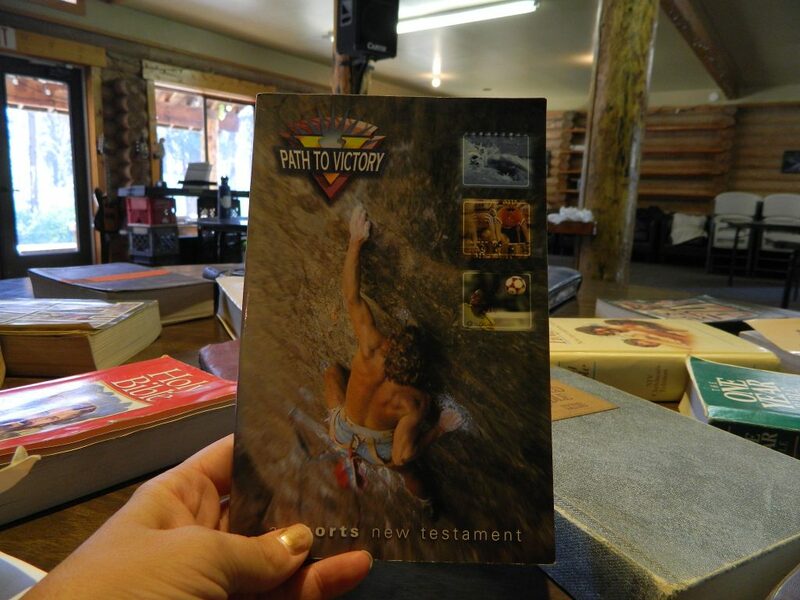 The camp has purchased a few copies here and there, but most of the Bibles in the Camas Meadows Bible Cupboard arrived here naturally, ie. in the hands of forgetful campers. 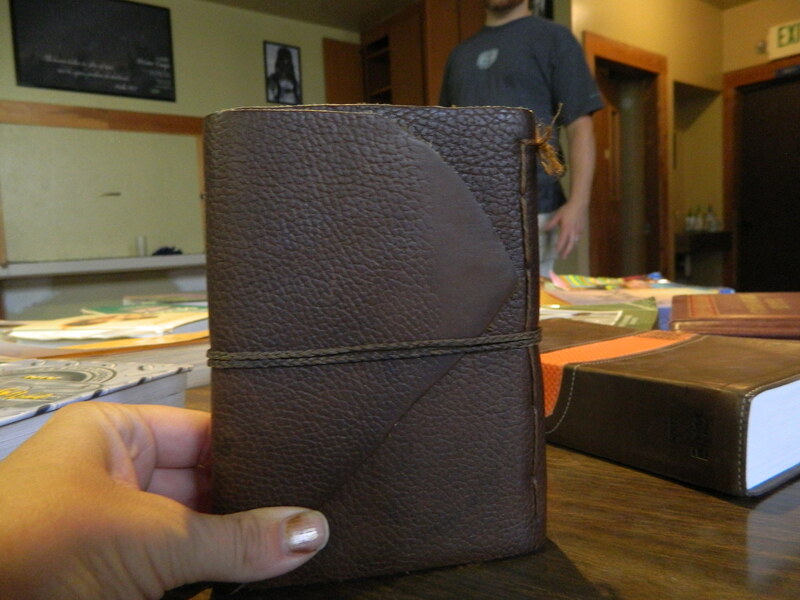 Camas Meadows Bible Camp was founded in 1973 and a few Bibles attest to the presence of those earliest campers. Bell bottoms, hair parted in the middle, and bubble letters adorn them, but the word of God contained within is the same. 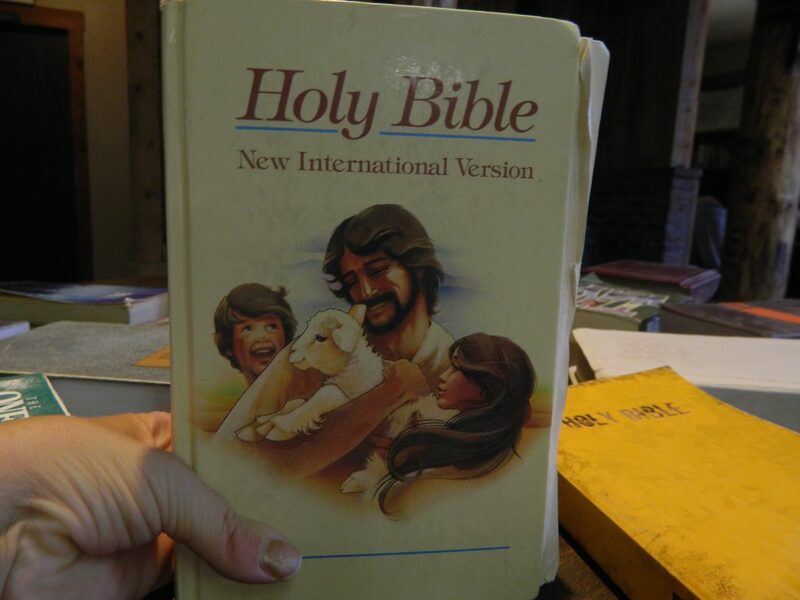 Next came the 80’s with Precious moments and Cartoon Jesus. 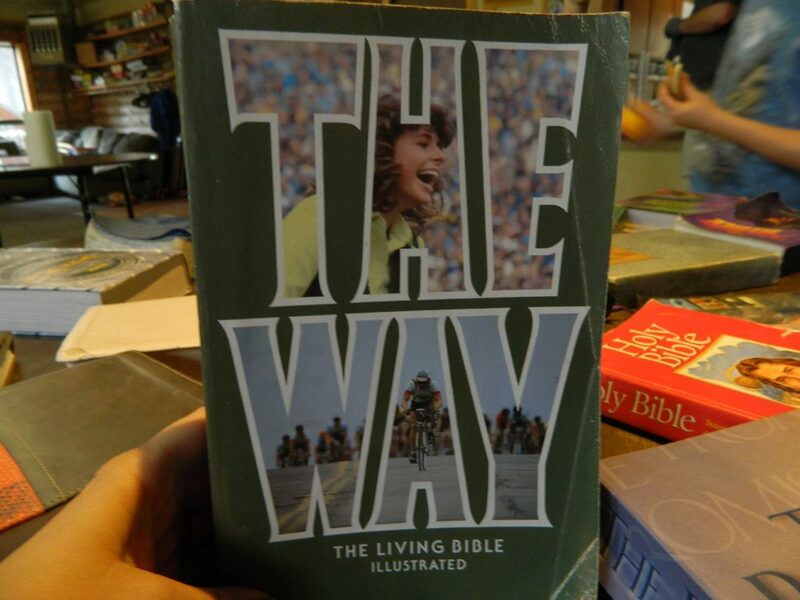 Then the 90’s, brought us The Adventure Bible, rock climbing Bible, Hand’s On Bible, Lots of calming wheat fields, and the Teen Devotional Bible. 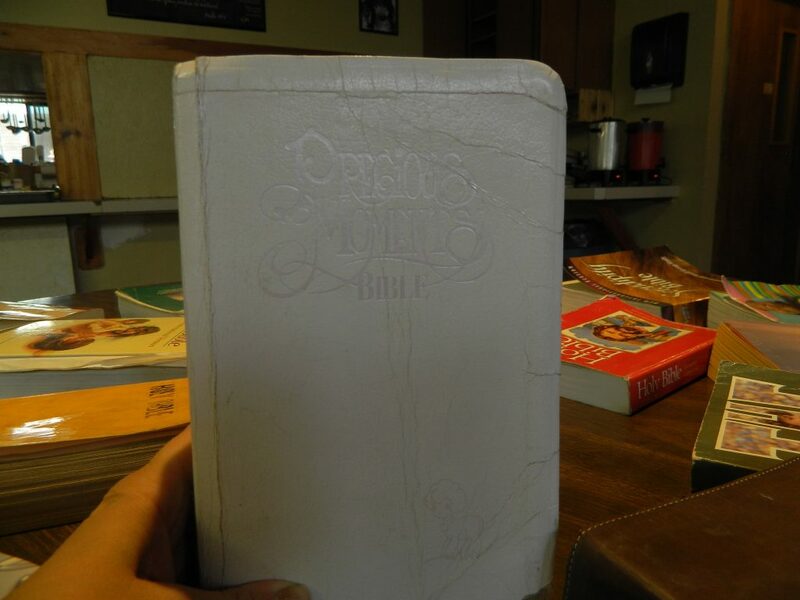 Finally, the 2000s left us with an assortment of leather hiker’s Bibles, the chrome diamond plating Bible, and of course a Bible decorated with torn purple scrap book paper. 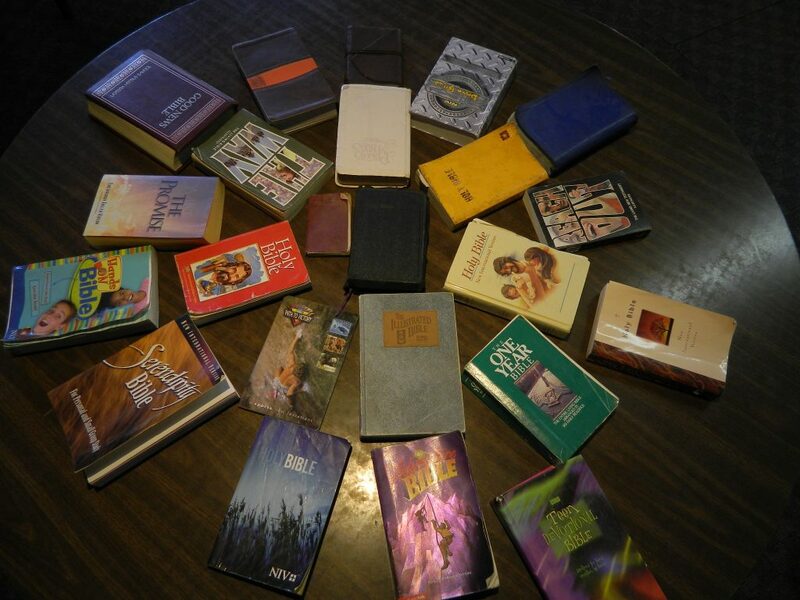 Whatever decade brought them, these Bibles remind us of the campers who have come and gone and perhaps come back as counselors, speakers, dishwashers, cooks, and the amazing group of hard workers that fuel the camp work retreat weekends. 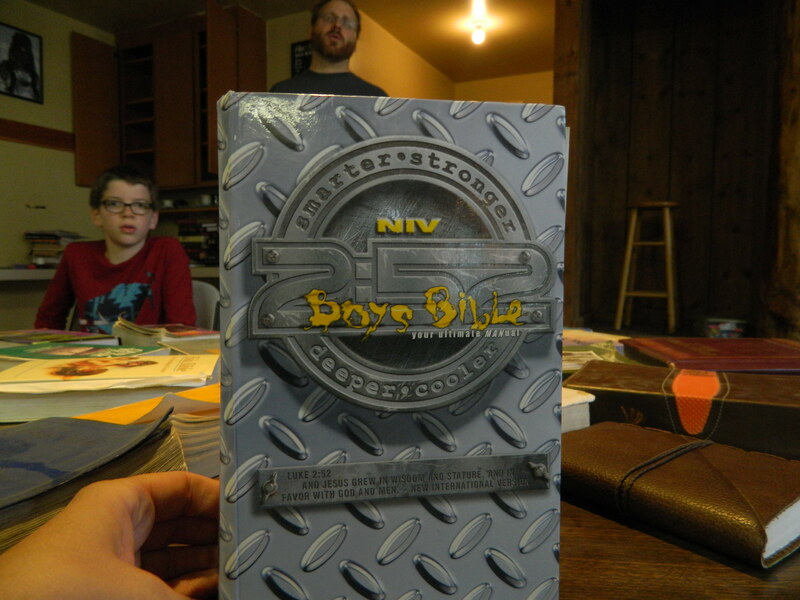 The Bible covers change, but the Word of God remains powerful and fresh. The camp experience remains essentially the same as well. Friends and fun, indoor and outdoor games, learning from God’s word, and delighting in the beauty of God’s creation. 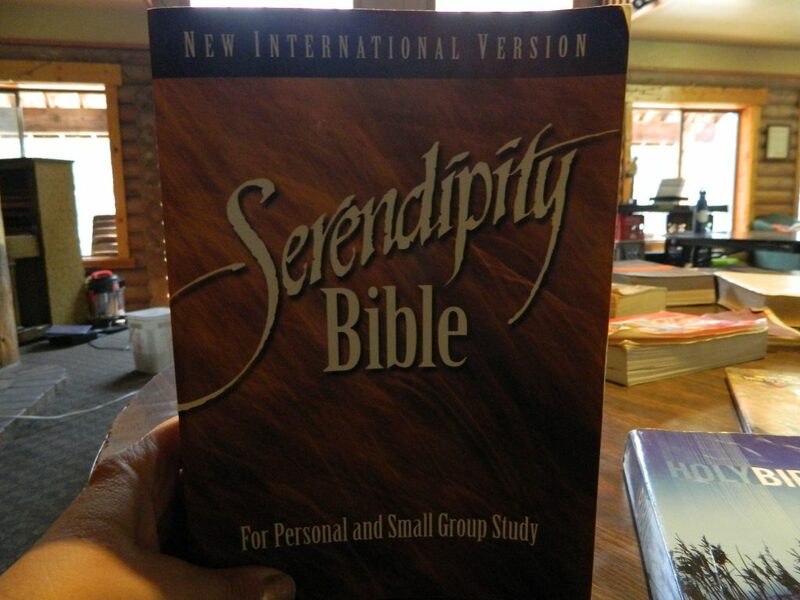 After cleaning out the dust and any copies that were too torn to use, I returned the Bibles to the cupboard. 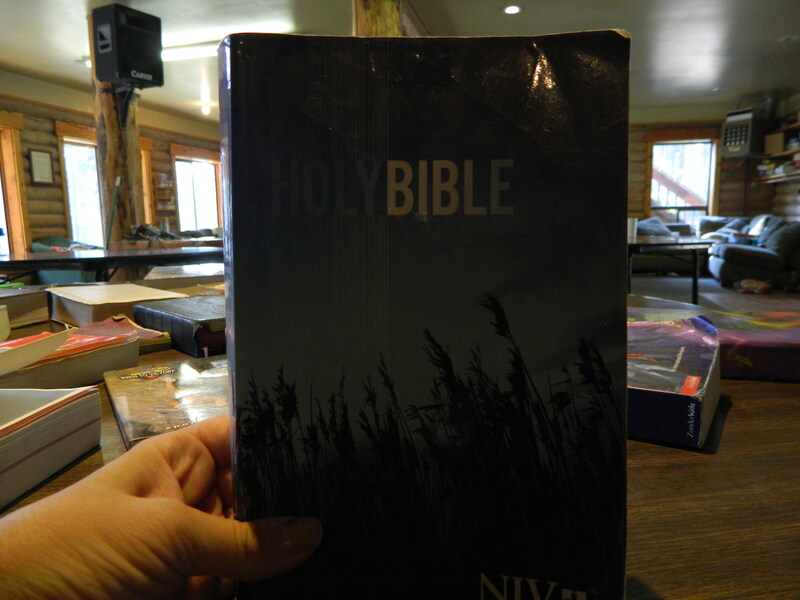 It is good to remember our past as we press forward and I love that when a camper forgets his or her Bible at home, the campers who came before have left plenty of Bibles to choose from. 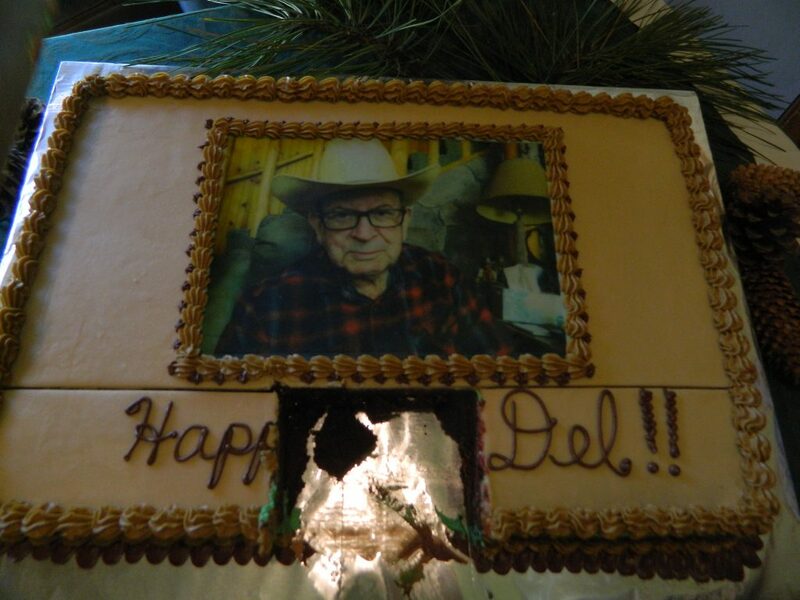 I’ve done a blog post about Del and Autumn, my dad Greg, Scruffy, Sweet Tea, even about Big Boy the elk. But I have neglected to tell you about my husband’s partner in this ministry, our downstairs neighbor, and the only person who was willing to teach the art of plastic sword fighting to a bunch of sugar-crazed kindergarteners at our youngest son’s birthday party. So…who is Choco? Choco started out as a camp counselor. On his first night as a C.I.T. he decided to scare some girls who were walking down the dark wooded path toward the campfire. Growling like a rabid bear he lept out of the woods making them scream in a satisfying fashion. Proud of his accomplishment Choco then proceeded down the path thinking that he was safe. Then out of no where, the furious form of Storm (one of our girl counselors) struck with deadly force. She smashed his 6’2″ frame to the ground in a flying tackle that Choco swears was far superior then those doled out on an actual football field. Thus initiated Choco has been with us ever since. He has been a counselor, our camp intern, he has directed the program, and leads our children in worship. He drives our camp bus, fixes all the vacuums, patches the inner tubes for winter sledding, brings back our electricity when the camp generator has one of its inexplicable catastrophes, and regularly has Nerf wars with my three irrepressible sons. Whether it is soothing the soul as he strums his guitar or rescuing us from the horrors of a smoking generator, Choco is a vital part of Camas Meadows. Thank you so much for all you do up here. For helping me clutch start my car, for plowing the road in the winter, and for choosing to laugh instead of growl when my boys run downstairs and jump on you with Nerf swords in hand. Choco, you are a blessing and a gift and we thank God that you came up to camp and haven’t left yet. And so there he is folks. I present to you…Choco. 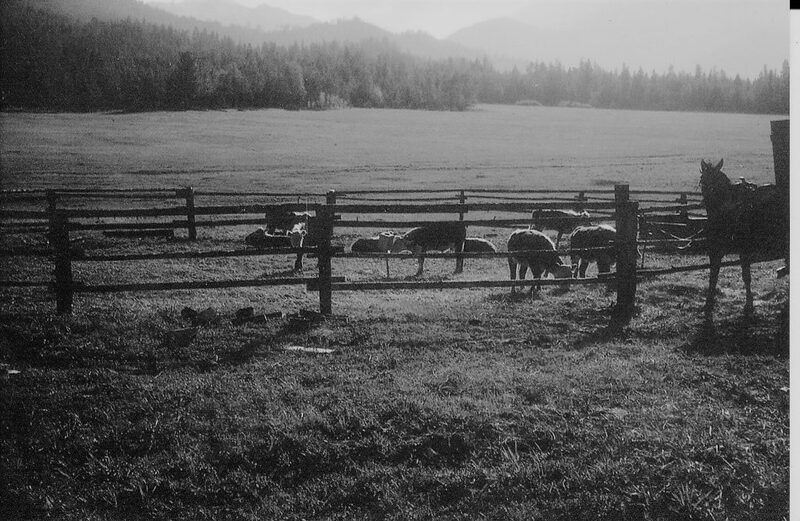 My grandpa Del moved to Wenatchee from Canada via horse drawn wagon. My grandma Autumn was the daughter of a fast shooting deputy and a southern beauty. And they had a dream…they just didn’t know what it was. They raised their family and reached retirement and the world was wide open with possibilities. But Autumn was burdened with the idea that they were supposed to do something specific with the property they owned up on Blewitt Pass, something for God. So she talked to her youngest son (my Dad) who was a Bible collage student at the time, and they began to pray. For three days they quietly stood before the Lord, seeking answers and a face for this invisible dream. On the third day Del strolled up to Autumn and said: “You know what I’d really like to do with that property?” He did not know of her prayers on that very subject, and so she held her breath and wondered what he would say. 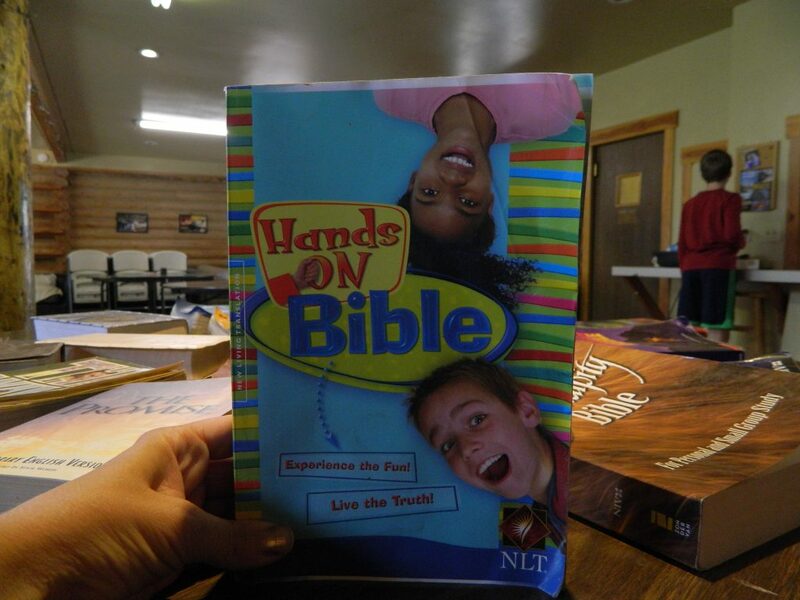 “I think we should start a Christian Youth Camp.” And thus Camas Meadows Bible Camp was born. The first camp was in the winter of 1973. 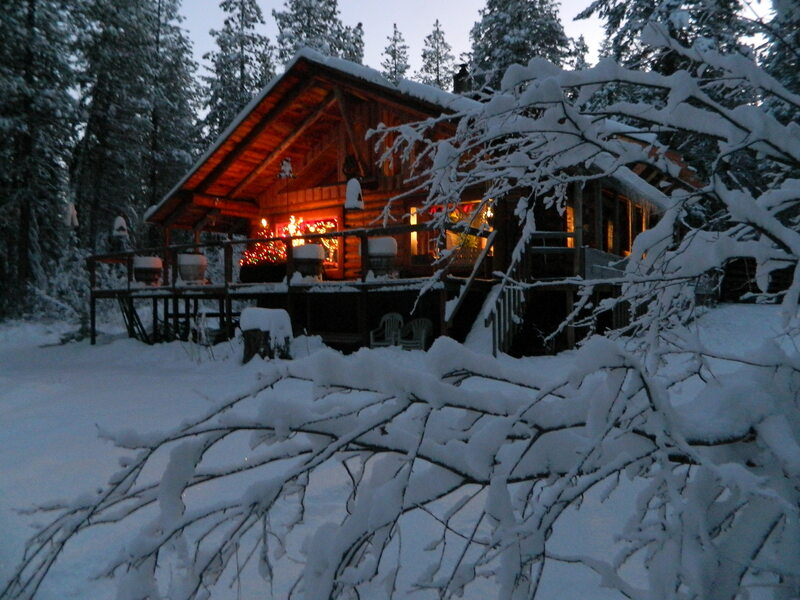 They only had the small lodge which housed about 20-25 people and no electricity, plumbing, or running water. The campers prayed and sang and learned about their Lord by the light of kerosene lanterns. They had to use chilly winter outhouses and Del hauled in water from a nearby spring in big metal milk cans. But it was a beginning, and since the whole crazy thing was the Lord’s idea anyway they figured that He would shuffle out the details. 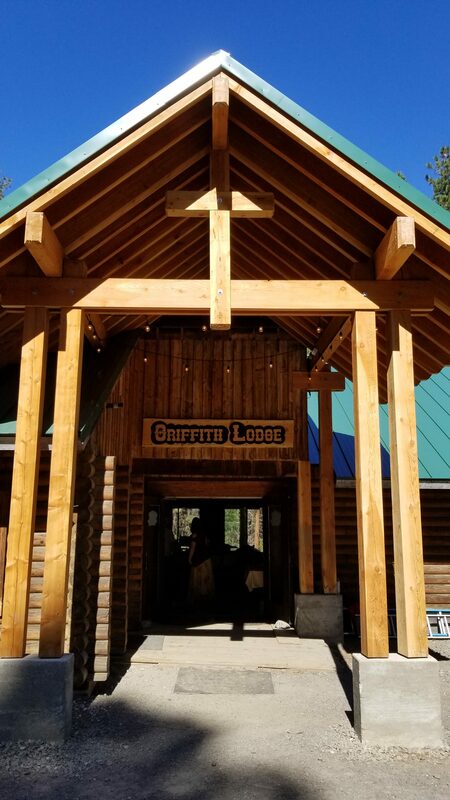 Now our capacity is 85 campers, we have two lodges and three extra cabins, and when you turn on the faucet actual water in both hot and cold temperatures comes out. Forty years after that first camp, God is still amazing us with His beautiful ridiculous ways. My grandparents didn’t get much of a retirement, but they obeyed. I only hope that upon looking back at my legacy, I will have been as faithful.